The idea came as so many good ones do: out of the blue. There had been another online story promoting internet bridal sales and, in the process, marginalizing independent salons. This was followed by the completely justifiable yet also predictable wave of angry responses from retailers and industry folk, many of whom wanted to lash back out. I had my own thoughts about the piece – it’s biased, it’s inaccurate, what irresponsible journalism! – but despite how strongly I felt, soon afterward life took over. There were deadlines to meet, writers to talk to, and interviews to conduct; with that, my feelings faded into the background. Until, of course, another similar story popped up a couple of weeks later on a different site and the cycle started over again. Someone once described the process of going after counterfeiters as “a giant game of Whack-a-Mole” – once one gets shut down another simply pops up. Although not quite the same thing, online stories that misrepresent the industry and specifically brick-and-click stores sometimes feel the same way: there always seems to be another one, and it never fails to provoke the same upset reactions. VOWS discussed proactive ways we could fight back against this frustrating phenomenon, and with that the Rapid Response Editor program was born. We officially launched in September with the mission of responding to, commenting on or correcting any online story that misrepresents the industry, brick-and-click stores, or our customers. We can’t stop the (often!) paid-for content that denigrates our businesses but we can react to and comment on discrepancies… while offering the author assistance for future articles. I feel like this is a positive way to counter such stories while sharing our important perspective. As such, I have taken the lead and will be monitoring, reviewing and responding to any such articles in the VOWS voice. To keep abreast of these offending stories, I subscribed to a variety of different news and key-word alerts; I also regularly monitor the chatter in online groups. However, as there is tremendous power in numerous sets of eyes/ears, I could use your help. When you come across a local or national online story that you feel needs to be addressed, please e-mail the link and details to me at Shannon@vowsmagazine.com (use the subject line “Rapid Response”). I will review the story and, when appropriate, respond. It’s a small step but I believe it will be an effective one. Independent retailers play such an important role in today’s experience-hungry shopping society. I’ve always believed in value of the knowledge, expertise and excellent experience you offer customers, and look forward to assuming a larger role in help spreading the word about all you have to offer. After all, customers can’t experience what they aren’t aware of. Many simply need to be educated about all of their shopping options! Together we can – and will! – make a difference. 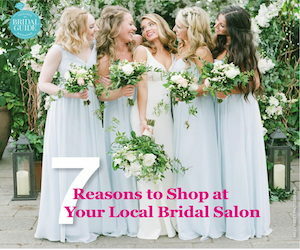 A huge thank you to Bridal Guide, which recently launched an awesome new ad campaign designed to strengthen support for brick-and-mortar bridal retailers. 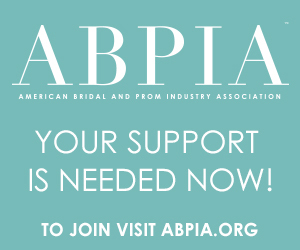 All brick-and-mortar retailers as well as traditional bridal manufacturers are encouraged to include the ad on their sites and in their stores. Check it out on pg. 113. Touché. Yes, even Amazon knows it – brick-and-click retail is alive and well today!